The Storm Prediction Center started off the morning by issuing a Slight Risk for severe thunderstorms, but has since upgraded to a High Risk, centered in Arkansas. A line of supercells, now merging into more of a squall line, is marching across parts of the Midwest into the Mississippi River Valley area, putting down numerous tornadoes from Wisconsin to Arkansas (see the radar image, above; tornado warnings are small red boxes, while tornado watches are larger red boxes and severe thunderstorm warnings are are in blue). 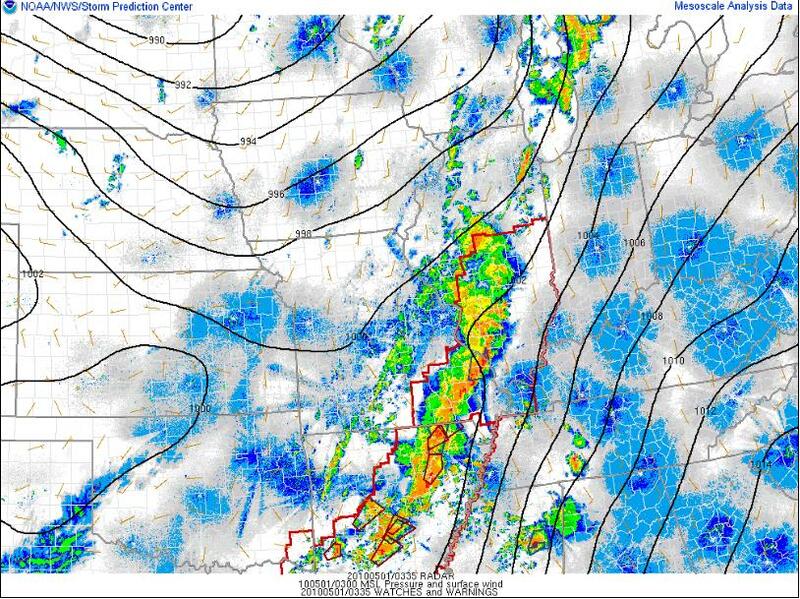 Ample CAPE and wind shear have been conducive to rotating storms in this general area, along a cold front, for most of the afternoon. Sadly, there have already been reports of deadly tornadoes in Arkansas. Tomorrow, the storms will progress towards the Southeast, giving the already tornado-weary Mississippi and Alabama another chance for severe storms. The low that is responsible in part for this severe weather may be the last one we see for a while, on the Plains anyway. Models for at least the next week show primarily zonal flow across the US, meaning no big troughs to assist in producing strong thunderstorms. Well, I got my laptop back Monday night, but found out on Tuesday that it takes much longer to start up than it did before, and it won’t come out of standby. I did manage to back up the few files that I had not backed up since the last update, including a few website files. So although I took my laptop back to Best Buy yesterday, I should be able to manage doing some website (and blog!) work now…although I am still pretty swamped, so time spent on both may be limited until towards the end of next week (the end of the semester, woohoo!). The first thing I did was update the photo of the week (it’s a tornado) and the “this day in history” blurb on the front page. When I did that, I noticed that this older computer messed up the color scheme a bit, and I haven’t been able to figure out how to fix it yet. My problem is that I want to have hyperlinks in blue, with the exception of the hyperlinks overlaid on the dark purple tabs on the left side of each page. I didn’t have a problem with it with Vista (now I’m back on XP), so I may just have to wait to fix once I get my newer laptop back. In the meantime, I tried to keep the white hyperlinks on the front page, while highlighting anything else that should have been blue. When it came time for the chase pages, though, I just left them as is…for now. I also went through my chase photos from Thursday and picked out a grand total of 45! That’s something else I want to eventually do for the website–find or create some sort of slide show program, where everyone can click through the large photos (kind of like Webshots does it)…rather than seeing the thumbnails and having to click on every one you want to see. Anyway, that’s for the future. I did post the chase log and photos for April 22, so you may want to go check that out–there are lots of tornado photos! I also took some HD video, but as my disclaimer on the photo page says–I couldn’t post HD quality. I use Windows Movie Maker to edit videos, so I wanted my raw video converted to WMV. When that happened, it was degraded to standard definition. The video was then further degraded when I saved it from Windows Movie Maker. So what I uploaded to YouTube is not the original video–the original is clean and sharp. I will have to find a way of posting at least higher quality video, if possible. For now, I don’t have the time to mess with it, especially as I’m wrapping up stuff for the semester. The Texas target verified on Thursday, and I saw my first tornado of the year! It occurred out in the middle of nowhere, and according to the NWS it only damaged some power poles. It was the strongest, most long-lived tornado in the panhandle that day (not including the wedge near Childress around sunset), rated at EF1 and lasting 20 minutes. 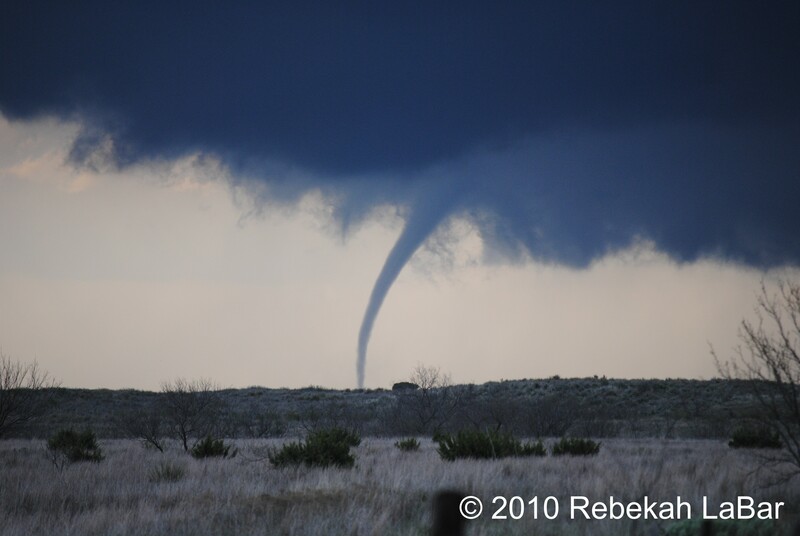 EF1 tornado on 22 April 2010, near Goodnight, Texas (click to enlarge). Now I’m off to Catoosa (just northeast of Tulsa) to attend a memorial event for the seven victims of the 24 April 1993 F4 tornado, the strongest tornado to ever hit the Tulsa area. A 35-foot-tall metal tornado statue will be unveiled, and a large electric motor will cause it to rotate. I’ll post pictures later today or tomorrow. Today there’s a surface low setting up over Colorado, with a warm front that will later extend through central Kansas and a cold front that will move into eastern New Mexico. A dryline will set up in the central Texas Panhandle, with dewpoints ahead of the dryline in the upper 50s and lower 60s. Winds will back south of the warm front and along the dryline, where CAPE is forecast to reach between 1500 and 2000 J/kg. A large trough with a closed low is moving over the southwest, and will provide the lift and upper-air winds to support strong to severe storms. Wind shear will be present, especially near the warm front. I expect there will be supercells today along the dryline in the Texas Panhandle, with some large hail and possibly a few tornadoes. Another point of concern is the triple point, up near the low…it’s a bit of a tough decision for me, between messier precipitation and possibly better shear up north in Kansas, and isolated supercells (at least until the cold front catches up to the dryline and we get a squall line, hopefully not ’til after dark) and slightly lower shear along the dryline. At this time I’m favoring the dryline, partly because it’s the Panhandle–and I really can’t resist a dryline chase in the Panhandle of Texas! Besides, cloud cover may prove too formidable up near the low. I may be streaming today on ChaserTV, if I get my camcorder to work with my old laptop (newer one still in the shop). I will probably be on Spotter Network as well. There won’t be any regular updates to my website (and probably not much to the blog, either) for at least the next several days…as my computer decided to not start up yesterday and I had to take it to Best Buy to be serviced. I lost a few files and updates, but thankfully nothing too serious. I’ll probably be fairly busy over the next few days, trying to re-create lost files and update old files to my older laptop…including starting over on my final project for my GIS class. Hopefully I’ll return to more regular posts and updates by the end of the week or so.